Hey guys! see you in boston at the convention this weekend! 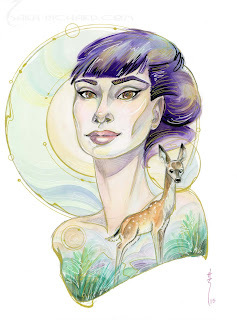 just finished my charity sketch of audrey Hepburn and her deer Ip. I always loved the two of them together since Audrey herself is so doe like. I know its not comic related...but it's where the wind of inspiration took me. You can bid on this at the charity auction Saturday night at the convention! Next week I'll be at the Stockton , CA Comic Con! see you there west coast!